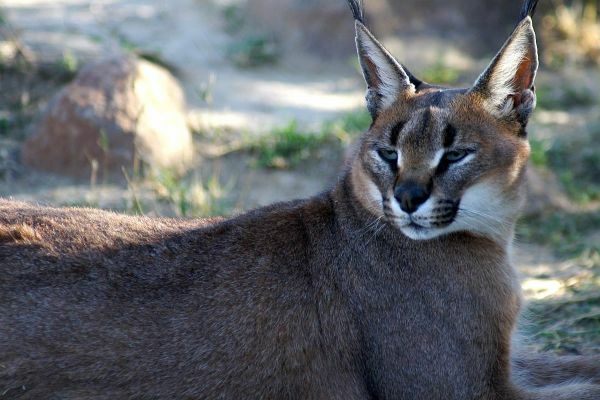 The caracal is wine-red, grey or sand coloured with black marks above the eyes and long, tufted back ears. Distribution: Widespread south of the Sahara. Habitat: Dry steppes, semi-desert, woodlands, savannah and scrub forest. Field characteristics: Males 13-18kg, females lighter. Head and body length 65cm. Tail length 30cm. Shoulder height 40-45cm. Colour: Wine-red, grey or sand-coloured. Black marks above the eyes. Characteristic long, tufted black ears. Feeding: Opportunistic. Largely nocturnal. Prey comprises hares, hyraxes, birds, lizards, snakes. Able to catch small antelope, roosting raptors and domestic livestock. Most moisture obtained from the tissue fluids of prey. Breeding: Gestation period 70 – 78 days. One to four young are born in burrows, bushes or rock crevices. Lifespan: 12 years (17 years in captivity). Social system: Usually solitary, pairs for mating.